Over the past month or so, I’ve been feeling a bit stagnant on my job. I haven’t felt like I’ve been the most effective and it began to bother me. I found myself sharing with others how unfulfilled I had been feeling overtime. Last night was the very last conversation I had and it caused me to think past the very words I spoke. Instead of complaining about what I felt I couldn’t do; why not do what I could, where I was, with what I had. Often times we become discouraged because of the place that we’re currently in. We feel as though we can’t produce the way we intend to because of an uncomfortable place or situation. However, when we begin to look around us, we can find things to put our hands to. We shouldn’t limit or subject ourselves to the situation we’ve been given. We can complain and talk about how we’d rather not be in that place; or we can make the best of it, put our hands to other things in the process, and work on how we can become better. When our desire to see change is greater than what we currently see, we’ll be able to be more effective. Sulking ourselves and others in what we dislike doesn’t change much. We have to be dedicated to the conversion we’d like to take place. Then and only then will we be able to make progress. This reminds me of a sentence I read in one of my devotions recently, “what you focus on, grows.” If we focus on the unpleasant feelings, that’s what will begin to grow and keep tugging at us. On the other hand, when we begin to put all of our focus on the actions we need to take in order to change our situation, that’ll take precedence over the negative feelings. So just as I’m encouraging myself, I encourage you to shift your focus. Change your attitude and your mindset. Begin to look at your surroundings without eyes of frustration, but rather the eyes of change. Let’s be agents of change and do what we can, where we are, with what we have. 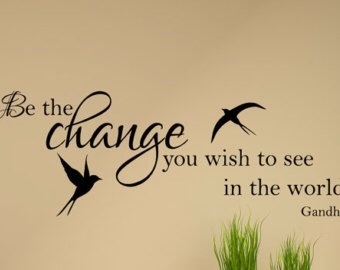 We can be the change we wish to see.